If you are looking for effective antivirus and firewall software, you are doing the right job by considering ZoneAlarm, which was originally developed by Zone Labs LLC and is now being distributed by Checkpoint Software Technologies Ltd., a reputable provider of software for network security. Employing around 3,000 specialists on networking and security all over the globe, Checkpoint continues to improve its offerings and innovations, something that is very evident in the constant development of ZoneAlarm as securitysoftware. No wonder ZoneAlarm is reported to have more than 80 million users worldwide. ZoneAlarm Pro Firewall 2018 (from $39.95/ year). This is a standalone firewall software for Windows operating systems, stopping incoming and outgoing threats from arriving or leaving a computer system. It is compatible with antivirus programs from other providers. ZoneAlarm Pro Antivirus and Firewall 2018 (from $39.95/ year). Provides essential antivirus protection and internet security for up to three PCs.Features include real-time antivirus, antispyware, identity and data security, online backup, two-way firewall, browser protection, and blocking of data-collecting sites, among others. ZoneAlarm Extreme Security 2018 (from $69.95/ year). Provides total protection for up to three PCs or mobile devices through the best antivirus package that includes zero-day attack prevention, advanced two-way firewall, identity and web security, PC tune up and parental controls. Setting up ZoneAlarm is easy, although it can pose a bit of a challenge for some users. The good thing aboutZoneAlarm is that you do not need to download and install more than one application, unlike other security software. Usage is considered easy, since all the features are broken down into three categories to keep everything in order: Mobility & Data, Web & Privacy and Antivirus & Firewall. So if you want to run an antivirus scan, you just need to click two buttons. However, there are some features that require more action from the user before they can be run. Take for example the Max Security Mode setting, which gives the user full manual control of the program. Fortunately, ZoneAlarm offers many forms of support for users who are not very tech-savvy. With the exception of ZoneAlarm Pro Firewall, the packages that ZoneAlarm Pro comes in offer average virus detection and removal rates. Although ZoneAlarm’sprotection against computer infections leaves something to be desired, the kind of firewall ZoneAlarmdelivers is almost second to none in the market. The thing about ZoneAlarm’s firewall and network security is that they do not come without a consequence. Because they are powerful, they take their toll on the performance of the computer system by using up more resources than other security software. Then again, that is a small price to pay, compared to the kind of protection ZoneAlarm antivirus brings. ZoneAlarmcan be a bit difficult to use, as stated previously. But to this, the ZoneAlarm team has an answer: different kinds of support for users. Although ZoneAlarm is developed in a way that keeps you from encountering many issues, the team still provides many methods to contact them, including email and live chat. 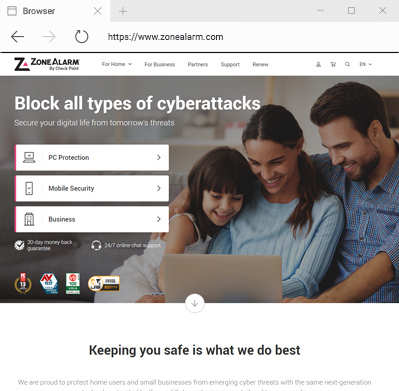 While ZoneAlarm does not offer phone support, it makes up for this lack through its rich FAQ page and knowledgebase, tutorials and even a community forum where users can share experiences and get insights about common issues encountered with the antivirus and firewall programs. The price by which the different packages come can be considered a steal; nowhere else will you find a powerful antivirus and internet protection that is as affordable as ZoneAlarm. Whether it is the standalone firewall protection, the antivirus and firewall combo or the extreme security package that you are targeting, you will never go wrong in choosing ZoneAlarm because of its reasonable prices. Like other antivirus and networksecurity providers, ZoneAlarm comes with a 30-day money back guarantee. Not satisfied with the program’s performance? You feel that it is not for you? Then let the ZoneAlarm team know and you can have your money back, no questions asked. Threat Emulation. This feature allows you to check files from the Internet before opening them. This way, your computer or device is protected from malicious attacks and viruses that can invade your computer through email attachments and website downloads. This feature will open the file on a computer on the cloud, examine its behavior and report back to you whether or not the file is safe. Find My Laptop. Laptops are great for working on the go, but the characteristic that makes it a good tool is the same characteristic that can put it in trouble: its portability. ZoneAlarmallows users to locate their stolen or lost laptops with this feature, which also enables them to remotely lock out unauthorized users and to retrieve critical files. PC Tune Up. Aside from parental control, online backup, a privacy settings toolbar and advanced firewall, ZoneAlarm also offers this feature that helps improve the performance of your computer system by checking your registry for unnecessary and unused files, and removing these files to give you more disk space. Put together average detection and removal rates, powerful two-way firewall security and many additional features and you get impressive network security and protection that is none other than ZoneAlarm. Considered a classic in the antivirus and antispyware market, ZoneAlarm is a good choice, especially if you are on the lookout for a program that will give you good value for your money.